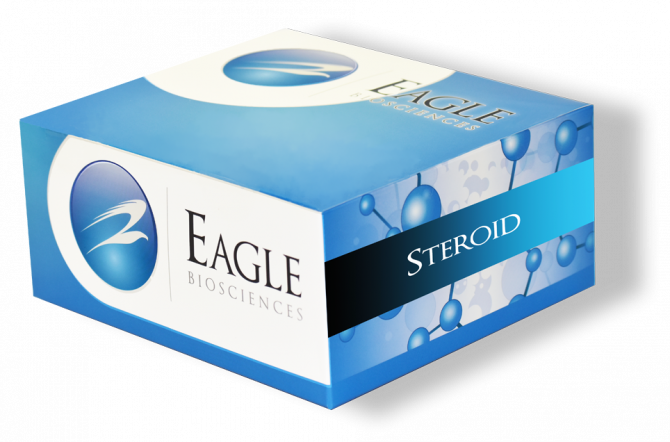 The Eagle Biosciences Salivary Cortisol Ultrasensitive ELISA Assay kit is designed and validated for the quantitative measurement of salivary Cortisol by ELISA. The Salivary Cortisol Ultrasensitive ELISA Assay Kit is for research use only and not for use in diagnostic procedures. In 1966, Katz and Shannon using the Porter-Silber method were able to determine corticosteroid concentrations in saliva and were able to show that concentrations of corticosteroids in saliva were related to blood concentrations. The advent of immunoassay made it possible to measure minute amounts of steroid hormones in blood. Subsequent modification of those assays allowed their measurement in saliva as well. These early assays, however, lacked validity due to matrix differences between serum and saliva, poor sensitivity and cumbersome extraction methods. Cortisol (hydrocortisone, compound F) is the principle glucocorticoid secreted by the adrenal cortex. Adrenal secretion of cortisol is modulated by a complex negative feedback mechanism involving the central nervous system, hypothalamus, pituitary and adrenals. ACTH released from the pituitary augments adrenal secretion of cortisol. In turn, increased levels of cortisol suppress pituitary secretion of ACTH while falling levels of cortisol are associated with rising levels of ACTH. Normally there is diurnal variation of cortisol with highest values measurable in the morning samples and lowest values obtained in the late afternoon. Cortisol levels rise independently of this circadian rhythm in response to stress or depression. In blood 90% of the circulating cortisol is firmly bound to cortisol binding globulin (CBG), 7% is weakly bound to albumin and only 1-3% is free or unbound. In saliva the majority of cortisol occurs in the free or unbound form and enters the saliva via intracellular mechanisms. Numerous studies consistently report a high correlation between serum and saliva cortisol indicating that salivary cortisol levels clinically confirm levels of cortisol in serum. The Eagle Salivary Cortisol ELISA Assay kit is designed and validated for the quantitative measurement of salivary Cortisol by ELISA. This kit features one 60 minute incubation for maximum assay sensitivity and precision as well as a saliva-like matrix assay buffer system containing a neutralizing agent for acidic or basic saliva samples. Cortisol calibrators and amounts of Cortisol-enzyme conjugate compete for binding sites on the antiserum. Cortisol from saliva or calibrators reduces Cortisol-enzyme conjugate from binding to the anti-cortisol. The basis of Enzyme immunoassay (ELISA) is the quantitative relation between ligand concentration and proportion of cortisol-enzyme conjugate bound to antiserum. Concentration of samples and controls are interpolated from the calibration curve. Liu et. al. “An Undergraduate Physiology Laboratory Module of Salivary Cortisol Measurement with an Emphasis on Circadian Rhythmicity and Quantitative.” Analysis Journal of the Human Anatomy and Physiology Society 2015: 19(3): 22-25.